Groundnut (Arachis hypogaea L.) an important cash crop, is an annual legume. Its seeds are a rich source of edible oil (43-55%) and protein (25-28%). About two thirds of world production is crushed for oil and the remaining one third is consumed as food. Its cake is used as feed or for making other food products and haulms provide quality fodder. 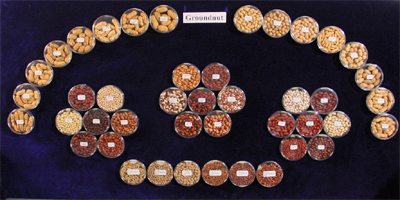 Botanically cultivated groundnut can be classified into two subspecies which mainly differ in their branching pattern: subspecies hypogaea with alternate branching and subspecies fastigiata with sequential branching. Each subspecies is again divided into two botanical varieties; subsp. hypogaea into var. hypogaea (virginia) and var. hirsuta; and subsp. fastigiata into var. fastigiata (valencia), var. vulgaris (spanish), var. peruviana, and var. aequatoriana. In trade, the bold-seeded types are referred to as Virginia, the small seeded as Spanish, and a third type Runner is also recognized. The flowers are born in the axils of the leaves mostly near the base of plant and have generally yellow petals. It is a self pollinated crop. After fertilization stalk of ovary elongates and forms peg which contains fertilized ovules at the tip. The growth of peg is positively geotropic until it penetrates soil to some depth (7 cm). The tip then becomes diageotropic and ovary starts developing into a fruit called pod which contains seeds. Generally, it takes about 60 days from fertilization to full pod maturity. Groundnut originated in the southern Bolivia/north west Argentina region in south America and is presently cultivated in 108 countries of the world. The ideal growing conditions for groundnut are well-drained, light colored, loose friable, sandy loam soil, availability of optimum moisture in pod zone, and an optimum mean daily temperature of about 30oC. It can be grown either as a sole crop or in combination with other crops in inter or mixed cropping. Click here for Taxonomic classification of Arachis sps.